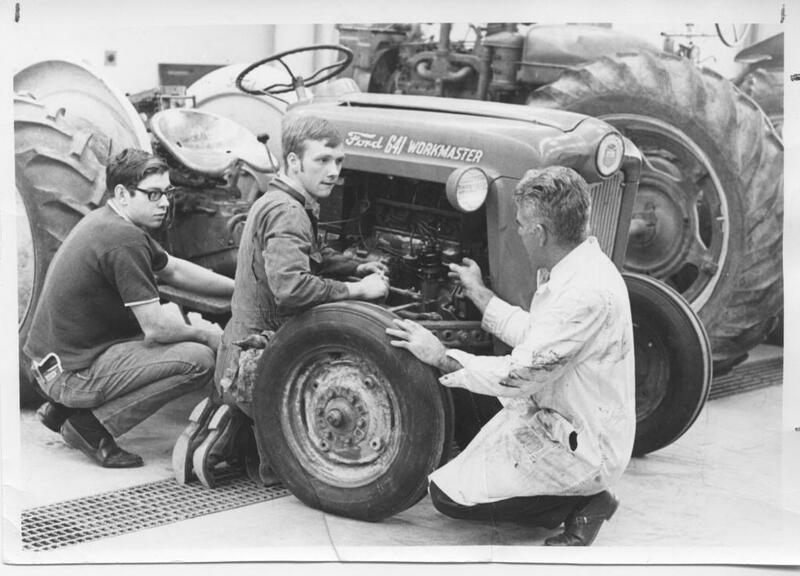 Gerhardt (Doc) Bohn, professor in Agricultural Engineering Technology, is shown here with two students. Nearest to Bohn is Mark Kimball, 1972. Kimball served as a technician in the Plant and Earth Science department and then as a UWRF safety officer until his retirement. Can you identify the other student on the far left? I taught Agriculture Education in the Clintonville Public School System from 1973-2007 when I retired. In retrospect the best thing about UWRF was the caring nature of the staff. I was lucky enough to spend 34 years in the best profession. I received both my BS and Masters degrees from River Falls. Looking back now, it was an excellent choice. I was fortunate to have a top of the line career teaching at Greenfield Iowa, Weyawega-Fremont and FOTC. Even after 13 years it still gives me rewards. I enjoyed having professors who took a personal interest in each of their students. UW-River Falls provided an excellent education foundation which led to a very successful career for me. UW-River Falls provided a tremendous learning environment. I said, “I’m dead meat.” I thought for certain that I’d get a call from the Dean, but I didn’t. Late one afternoon in the summer of 1961, while I was working at the store selling shoes, Mrs. Helen White came in and asked if she could talk to me. I had sold shoes to her and her husband, the retired District Judge Charles White, so we knew each other quite well. She was an elegant lady. She went on to explain they had raised three sons and Charles Jr. was a lawyer in River Falls. The other two lived out of state. Since the judge had a stroke and there were some after effects, they always like to have a senior boy from college live with them in case they needed help with anything. She told me she had asked the dean for a recommendation and he had recommended me. Wow, I thought. What a surprise! Mrs. White asked if I could come to dinner with her and the judge. This would give them a chance to show me their home. It was a huge elegant white house on Walnut Street on a big lot. I was impressed. I couldn’t resist thinking how much hay it could hold. The meal was very formal. We had a good visit and she showed me the upstairs. We went up a beautiful stairway to three large bedrooms. All their sons were tall like the judge, so they all had “long boy” beds. I chose the room with a bay window facing east and overlooking the river. Mrs. White told me that the carriage house in back was for my car and that she would do my laundry each week. Now, I was a fairly religious and prayerful guy who felt that my prayers were finally being answered. Needless to say, we agreed on the rent and I moved in. My responsibilities were to mow the lawn and change the screens and storm windows. I said I could handle that. Life with the White was a dream. They made me feel like a son and not a tenant. They kind of adopted me and I sure adopted them. I was student teaching at the campus school in my minor, Industrial Arts. I had the electricity unit. When Mrs. White found that out, she asked if I could replace the light switch in their bedroom. I did and that really impressed them. Every so often they would invite me to dine with them. We got to know each other very well. When we finished seminars, it was party time. Things were going fine until we ran out of beer. Johnny’s was already closed, but I remembered that the judge had some beer under the basement steps. We borrowed that. I took up a collection to replace it. We cleaned everything up and all was well. That was, until the next day when I came home from work and the black ’61 Chevy was in the driveway three days early! The judge looked at me like I’m sure he had done thousands of times when he handed down a decision and said, “Joe, why don’t we just consider that our contribution to your party!” I wanted to hug them both, so I did. What a wonderful experience at that time in my college career to know and experience such a gracious, caring family like the Whites. I stopped to visit them many times on my way back to Eau Claire to visit my own mom and dad. I’m writing to tell “the rest of the story” to one of your articles that appeared in your May 2 edition. 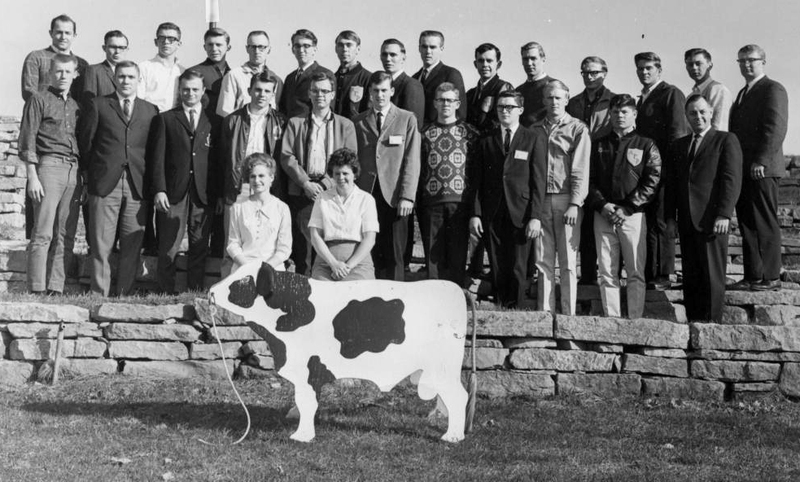 It will be 50 years this August that I married a Wisconsin farmer, who had gotten his animal science degree from UW-Madison a year or two before. He had gotten it through the G.I. Bill, after having served in the Korean War. I might add that his Army job was to build the airstrip in Teague, South Korea. He was put on that assignment because he grew up on a dairy farm in Wisconsin and could handle large equipment. A year or two after finishing his degree he became the manager of a large horned Hereford/registered Quarter horse operation just outside of one of Wisconsin’s larger cities and it was at that time that he took a bride from the suburbs of Chicago. Many Friday evenings or on Sunday the couple would go into town to the large hotel that always served a very large buffet. 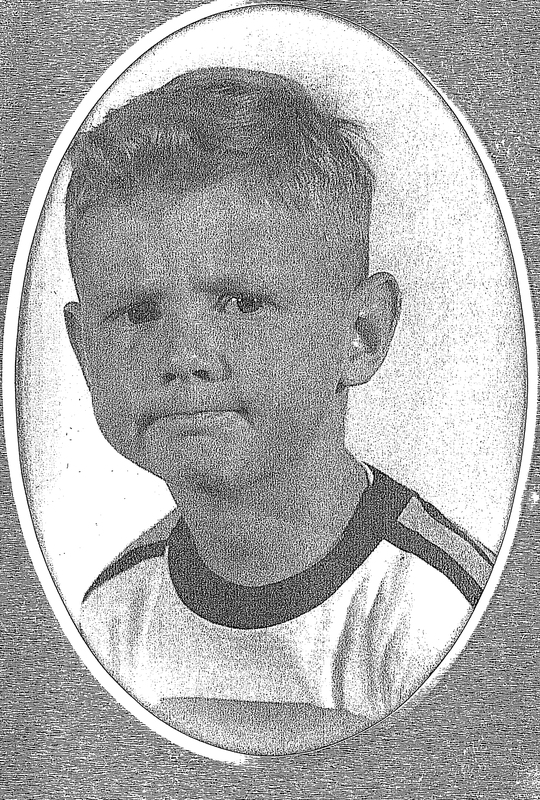 It was there that a 16-year-old, redheaded, freckled-face, high school busboy would hound the farmer with questions about farming. He was a “town” kid and knew nothing about farming, but indeed had a driving interest. All through the meal he would do his busboy job only to come back to the table time and time again to pry more and more farming information out of the farmer. After many weeks – or was it months? – the farmer’s bride made a suggestion. “Why don’t you hire that kid on the farm? He seems to have a real interest in farming and in what you are doing,” she said, hoping that if he was hired on the farm, they could eat their dinner in peace when they came to town. That is just what the farmer did. He hired the red-haired, freckled-face high school kid from town part time to begin with and full time in the summers. When “the kid” graduated from high school, the farmer and others around him encouraged him to go on to college and try for a degree in agriculture, some even contributing small amounts in finances. With all of us watching, “the kid” went on and on and on until he received his professorship in the animal science field. So when I saw a quote in your paper by the now-retired, redheaded, freckled-face kid from town I once knew, I had to write. Who was the farmer? Don Prill, father of Alicia Prill-Adams, assistant farm director at UW-Platteville. Who was the busboy? 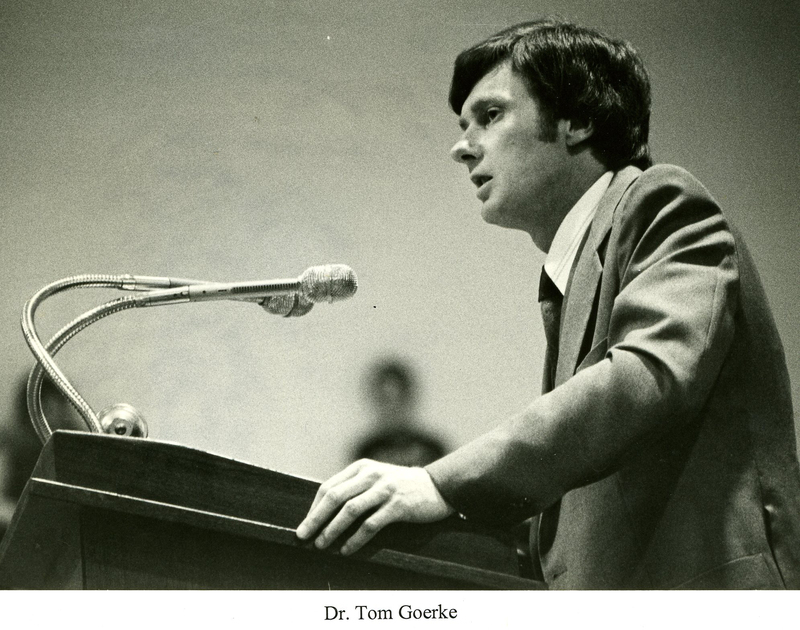 None other than UW-River Falls retired animal science professor Tom Goerke. Who am I? The farmer’s bride, and I just felt the need to tell “the rest of the story.” Also, because we can now eat in peace. Three people have benefited because one Wisconsin grown-up dairy farmer served his country, got his education, expanded to cow/calf production and took an interest in them. Congratulations to the three who have learned so much from that 80-year-old farmer. Tom Goerke starting off his teaching career. It was back in 1963 and I was really surprised since I was never on the “Dean’s list,” actually never even approached it. I received a note while I was in class, and it said to contact the Dean’s office as soon as possible. After class I immediately went home to the college apartments to use the communal phone. We had one pay phone for 21 apartments located in a hall closet. Superman would have liked this phone booth, no windows and a door you could close for privacy. I called the Dean’s office with all kinds of possibilities going through my mind. Perhaps it was a sticky campus problem the Dean wanted my advice on, or maybe the correct spelling of my name for an award I was to receive. Anyway, the secretary asked if I was the one who owned a hay wagon piled high with old boards located behind the college apartments. I said indeed I was. I then went on to explain that I recently attended a farm auction and had purchased a brooder house for five dollars. The opening bid was five dollars and I obviously was the only one who recognized the true value of this great buy. I disassembled the building and put it on the hay wagon I had built in Gary Bohn’s welding class. I then hauled it home so that my brother and I could convert it to an ice fishing shack. We wanted to take advantage of the lakes north of River Falls. The secretary wasn’t really interested in my explanation or my good buy. She explained that this coming weekend was “parents’ visitation weekend” and I was to move my wagon as soon as possible and definitely by the weekend. Obviously it was considered an eyesore. P.S. We were told that the college apartments where I lived with my wife for three years, was originally a two-story chicken coop. After WWII it was converted to 21 small apartments for returning veterans who wanted to take advantage of the G.I. Bill. I figured if the College could convert a chicken coop to an apartment building, I could convert a brooder house to an ice shack! River Falls was a huge step for me. I went to a one room school house for grades 1-8 where my grandma was the teacher. Then it was off to Sparta High School and later, River Falls for college. 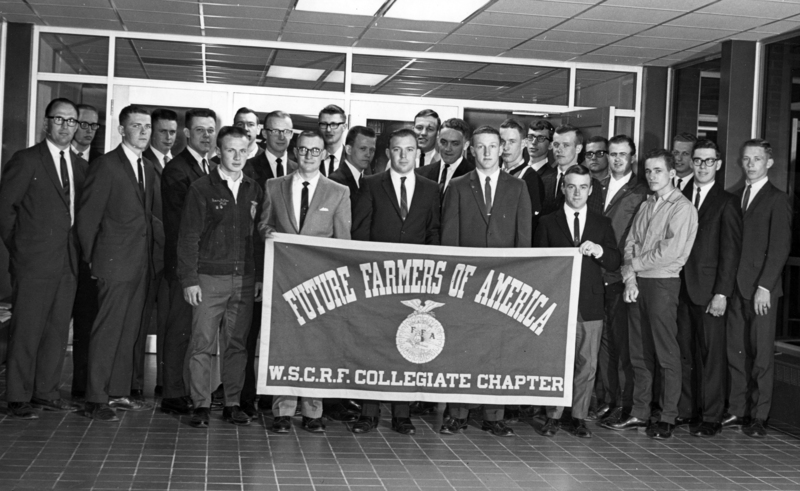 I had a tremendous group of professors for Agricultural Education. Dr. Matteson was a great influence on me throughout my time as an undergraduate and graduate student. I ended up with a B.S. in Ag Ed and a Masters in Teaching (plus 20 more credits). I taught Ag Ed for 39 years: 5 years at Plum City, 9 years at Marshfield Sr. High School, and 25 years at C.V.T.C. in Eau Claire. I am forever grateful for my college education at River Falls. Today however, I want to write about a part of my social side at River Falls. I met a group of young men whom all resided on first floor of May Hall. We came from all over the place with only one thing in common – we were all freshmen at R.F. College. We all hit it off and all graduated, but not in four years. Our friendship has continued after college to this day, when each year we meet back at River Falls during Homecoming. For most of us, it has been 44 years since graduation. While in River Falls, this group of guys was always together. We played on the same touch football team and we were all on the same softball team, which was very successful. We studied together and enjoyed a few barley pops every now and then. We all went our different directions after college. Our only common thread was freshman year – May Hall first floor. It remains a tremendous friendship and we are so thankful for our gathering at good ‘ole River Falls. Yes, we will plan to be at homecoming 2012 and by the way, I hope we will not be playing Whitewater! I can’t imagine picking out only one favorite memory from my short stay in college! My husband and I drove through the River Falls campus earlier this summer, checking out all the changes and I just had to take a picture of Hathorn Hall. THAT’s one of my favorite memories, and specifically the Passion Pits! I’m sure others our age will remember those small areas in the entrances to the dorm (residence hall now? ), where we “said” goodnight to our dates for the evening! Men weren’t allowed in our dorm rooms except for Christmas and maybe Homecoming. Otherwise the housemother had final say in everything, including late hours! It was so much fun living in the dorm with all the other girls – a new experience for a girl fresh out of high school. Then, I ask Bruce, my husband of 46 years, what his favorite memory might be, and he brought up the Rodeo Club. We were charter members of that group and he totally remembers his first, and only, ride on a brahma bull in the rodeo. He says no amount of practice riding on calves prepared him for the moment he saw the bull he was to ride! Both of us fondly remember living in the college trailer court while Bruce finished up his studies. On our trip there, we couldn’t even remember where it had been located. All of us living in the court were poor college students – one of us working while the other finished up – or one watching a baby and the other going to school and working. But we didn’t know we were poor, and had such visions of the future! It would be fun to find out where our neighbors are now. I can think of lots more memories, especially classes with Dr. Dollahon, and Bruce’s classes with Dr. Bohn. Bohn was a good friend for many years after college, too. Thanks for reviving the memories!